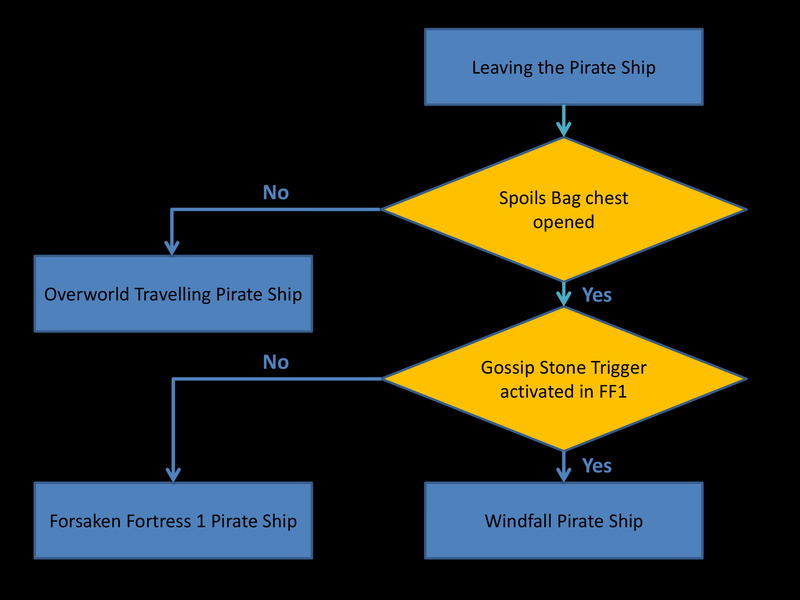 This diagram represents all of the major known flags and triggers in The Wind Waker. 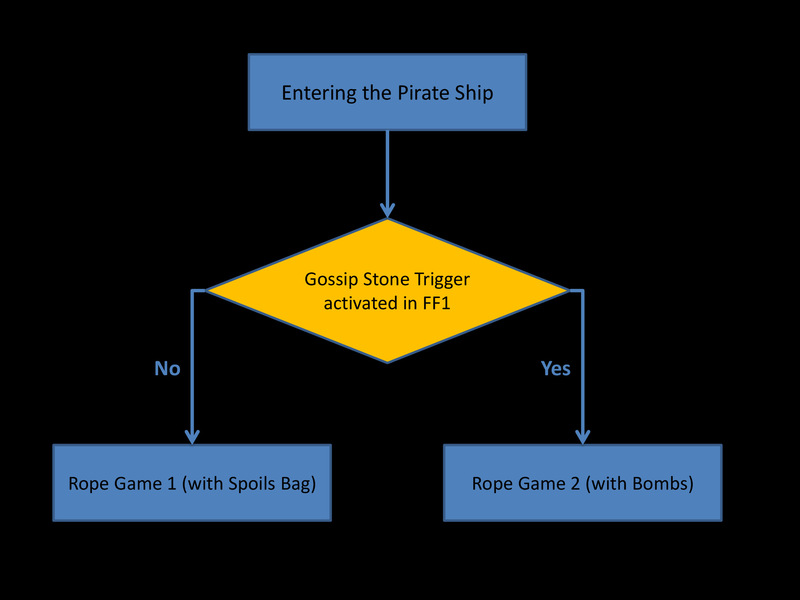 Outset stays in Prologue State as long as the Gossip Stone Trigger in FF1 isn't activated. That trigger can be skipped, which can lead to some more sequence breaks. Also note that the Outset Pirate Ship will be invisible, unless you watched the cutscene of Helmaroc coming to Outset, or you've saved Tetra in the forest. Note: On NTSC or PAL, the Outset pirate ship doesn't have collision when invisible, and so you have to make it visible before being able to enter it. On JP however, you can enter an invisible pirate ship. For exemple, savewarping can be used to go back to FF1 even if you have both the sword and the bombs in your inventory. A notable exemple of keeping these early game savewarp flags is Savewarp-escaping Hyrule 1. By obtaining all 3 pearls before beating FF1, and raising TotG before beating FF1, you can go into Hyrule 1 before triggering the last savewarp flag. This allows you to savewarp from the Master Sword Chamber directly to Outset, FF1 or Windfall. There is also a trick that allows you to go back to the previous day using the Greatfish cutscene. To perform it, superswim with double storage to Greatfish and pull out the wind waker to cancel camera lock before the cutscene starts. This skips KoRL talking and the fadeout to endless night. The wind waker pull is frame perfect, making this TAS-only.